Sony PlayStation Game published 19 years ago by Hasbro Interactive, Inc.
Missile Command © 2000 Hasbro Interactive, Incorporated. 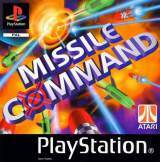 Missile Command for Sony PlayStation was released in 2000 (exact date unknown) in Europe. Sony PlayStation Network [PSOne Classics] [EU] (june.2, 2011) "Missile Command"